Before you travel, scroll down for a few words of advice. If you have a question or concern that is not addressed on this page, please feel free to contact us directly. 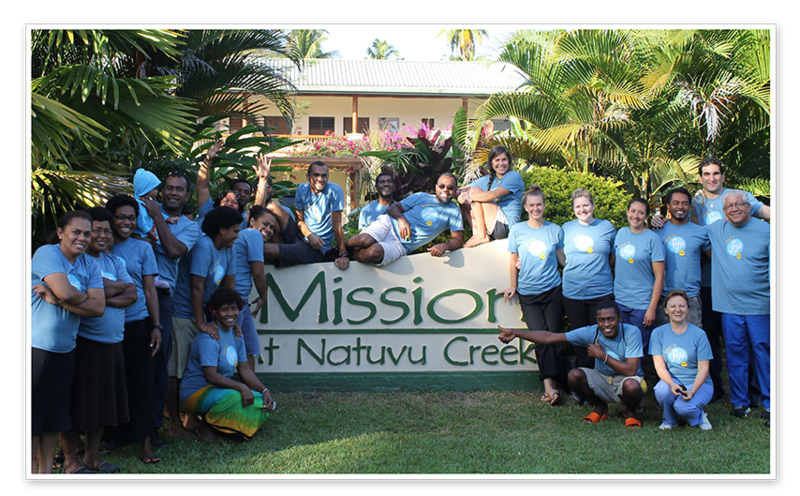 Situated on 750 acres and encompassing an extinct volcano that reaches an altitude of 1,200 feet at its peak, down through rain and bamboo forests, to the shores of Buca Bay, is the clinic and other facilities of the Mission at Natuvu Creek. MNC lies on the eastern coast of Vanua Levu, Fiji’s 2nd largest island, just two hours air travel from Nadi, Viti Levu, where the International Airport is located. You may fly to either Savusavu and travel by car for 1 hour and 45 minutes to the Mission or fly to Taveuni, Fiji’s third largest Island and travel by taxi for 20 minutes and boat by 40 minutes to the Mission. Both flights are under 2 hours. You must be in good physical and mental health. Any physical condition requiring special attention, diet, or treatment must be considered before confirming your trip to MNC. While we cannot cater to individual dietary restrictions we want to be aware of any life- threatening options and are happy to make sure you know what is in every meal. It is strongly recommended people requiring assistance be accompanied by a companion who is capable of and totally responsible for providing assistance. If you are a U.S. citizen, you will need a valid passport for entry into a foreign country and upon return to the United States. Passports must be valid three months beyond your intended departure date and have one to two blank pages remaining. We recommend six months expiration to be on the safe side. Allow sufficient time to have your application processed if you are applying for a new passport or renewing an expired passport. Visit www.travel.state.gov for more details. Visas are required for citizens of Kenya, Tanzania, Uganda, and Egypt. Travelers who are 17 years old or younger, when traveling with a sole parent, should carry a notarized letter of permission to leave the country signed by the absent parent. If you are not a U.S. citizen, please check with the embassy of the country you are visiting for information on documentation requirements.